Toby joins forces with a famous PI to save a general from embarrassment. The uniformed man standing before Toby Peters is General Douglas MacArthur, a soldier who considers himself the only man who can defeat the Japanese. But though he may be all-powerful in the South Pacific, today he is in Los Angeles with a problem only a detective can solve. The general has an eye on a post-war promotion to the White House, and an aide has stolen his war chest, his donor list, and a handful of embarrassing private letters. To get them back, Toby may need some help. Lucky for him, he's just met Dashiell Hammett, one of the finest crime novelists of all time. Dodging his mistress while he's waiting to rejoin the army, Dash needs amusement and thinks Toby's case sounds like a lark. In fact, the assignment proves dangerous. Toby may not be a soldier, but he's finally gotten a chance to die at a general's whim. About the Author. 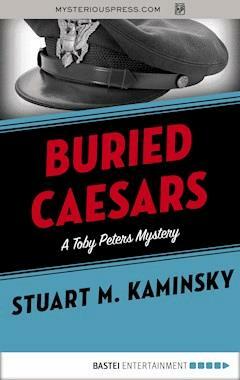 Stuart M. Kaminsky (1934-2009) was one of the most prolific crime fiction authors of the last four decades. Born in Chicago, he spent his youth immersed in pulp fiction and classic cinema - two forms of popular entertainment which he would make his life's work. After college and a stint in the army, Kaminsky wrote film criticism and biographies of the great actors and directors of Hollywood's Golden Age. In 1977, when a planned biography of Charlton Heston fell through, Kaminsky wrote Bullet for a Star, his first Toby Peters novel, beginning a fiction career that would last the rest of his life. Kaminsky penned twenty-four novels starring the detective, whom he described as "the anti-Philip Marlowe." In 1981's Death of a Dissident, Kaminsky debuted Moscow police detective Porfiry Rostnikov, whose stories were praised for their accurate depiction of Soviet life. His other two series starred Abe Lieberman, a hardened Chicago cop, and Lew Fonseca, a process server. In all, Kaminsky wrote more than sixty novels. He died in St. Louis in 2009. Review quote. "Impressive. . . . Kaminsky has staked a claim to a piece of the Russian turf. . . . He captures the Russian scene and characters in rich detail." - The Washington Post Book World. "Quite simply the best cop to come out of the Soviet Union since Martin Cruz Smith's Arkady Renko in Gorky Park." - The San Francisco Examiner. "Stuart Kaminsky's Rostnikov novels are among the best mysteries being written." - The San Diego Union-Tribune. "For anyone with a taste for old Hollywood B-movie mysteries, Edgar winner Kaminsky offers plenty of nostalgic fun . . . The tone is light, the pace brisk, the tongue firmly in cheek." - Publishers Weekly. "Marvelously entertaining." - Newsday. "Makes the totally wacky possible . . . Peters [is] an unblemished delight." - Washington Post. "The Ed McBain of Mother Russia." - Kirkus Reviews. Toby joins forces with a famous PI to save a general from embarrassment. The uniformed man standing before Toby Peters is General Douglas MacArthur, a soldier who considers himself the only man who can defeat the Japanese. But though he may be all-powerful in the South Pacific, today he is in Los Angeles with a problem only a detective can solve. The general has an eye on a post-war promotion to the White House, and an aide has stolen his war chest, his donor list, and a handful of embarrassing private letters. To get them back, Toby may need some help. Lucky for him, he’s just met Dashiell Hammett, one of the finest crime novelists of all time. Dodging his mistress while he’s waiting to rejoin the army, Dash needs amusement and thinks Toby’s case sounds like a lark. In fact, the assignment proves dangerous. Toby may not be a soldier, but he’s finally gotten a chance to die at a general’s whim. Stuart M. Kaminsky (1934-2009) was one of the most prolific crime fiction authors of the last four decades. Born in Chicago, he spent his youth immersed in pulp fiction and classic cinema - two forms of popular entertainment which he would make his life’s work. After college and a stint in the army, Kaminsky wrote film criticism and biographies of the great actors and directors of Hollywood’s Golden Age. In 1977, when a planned biography of Charlton Heston fell through, Kaminsky wrote Bullet for a Star, his first Toby Peters novel, beginning a fiction career that would last the rest of his life. Kaminsky penned twenty-four novels starring the detective, whom he described as “the anti-Philip Marlowe.” In 1981’s Death of a Dissident, Kaminsky debuted Moscow police detective Porfiry Rostnikov, whose stories were praised for their accurate depiction of Soviet life. His other two series starred Abe Lieberman, a hardened Chicago cop, and Lew Fonseca, a process server. In all, Kaminsky wrote more than sixty novels. He died in St. Louis in 2009. Copyright © 2012 by The Mysterious Press, LLC, 58 Warren Street, New York, NY. U.S.A.
All rights reserved, including without limitation the right to reproduce this e-book or any portion thereof in any form or by any means, whether electronic or mechanical, now known or hereinafter invented, without the express written permission of the publisher. This is a work of fiction. Names, characters, places, and incidents either are the product of the author’s imagination or are used fictitiously. Any resemblance to actual persons, living or dead, businesses, companies, events, or locales is entirely coincidental. The President of the United States ordered me to break through the Japanese lines … for the purpose, as I understand it, of organizing the American offensive against Japan, a primary object of which is the relief of the Philippines. I came through and I shall return. There was no point in trying to talk to Major Castle. We were sitting in the back of a big, 1940 custom-built Packard Darrin Victoria One-Twenty watching the coast go by and the sun go down. The driver was a tall, dry bolt of a man whose name I didn’t know but found out later. Castle hadn’t given it to me when he picked me up in front of my office on Hoover Street in Los Angeles. Castle hadn’t told me much on the phone when he had called. He said he was on a mission for General Douglas A. MacArthur. The mission involved me. He asked if I would meet him but the request sounded more like an order. It was the kind of request I might consider turning down if I had a few bucks in the bank and he hadn’t suggested that the outcome of World War II was about to be laid on my battered desk. It was September 1942, a clear Tuesday during which I had done some shopping—three pairs of socks and a new shirt from Hy’s for Him on Melrose. That left me with enough for a bag of tacos from Manny’s and gas to get my bleached Crosley through the next week. Major Castle had come when I clearly needed a client. I had shaved in the morning, gone shopping and waited to change into a pair of new socks and the fresh shirt until I got to the office I shared with Sheldon Minck, D.D.S. Sheldon was off that day on a mission of his own, the nature of which he did not share with me. I had suggested to Castle that I meet him in front of the Farraday Building. The alternative would have been for him to pass through the dark pit of tooth decay that was Shelly’s dental office, past the spit sink, into the Cabinet of Dr. Caligari I used for an office. It wasn’t impressive enough for army brass. Just before four, when I was scheduled to meet Castle, I had checked my face in Shelly’s mirror. Flat nose, graying hair, lopsided smile. The body was a slightly bulky 165 pounds on my five-nine frame, but that didn’t hurt when your business was looking like a mug and occasionally acting like one. A half century of abuse had molded my body for the job. The bad back didn’t show and the scars were covered by clothing.